Make your dresses look adorable. A vintage dress, 50's style outfit, A-line dress, lace dress, wedding ceremony dress, high waisted skirt, rockabilly dress, costume piece, etc. would be perfect to be paired with. Fit or not? Please measure first. Measure your waist by wrapping a tape measure around your natural waist, which is around the belly button level. SIZE (APPROX.) - Total length without stretching (includes bow/flower): 26 in (66 cm). Max. stretch up to 30 in (76 cm) for a comfortable fit. As the waist size may vary among same size lady, please measure around your natural waistline to check if the belt fits you. Belt width: 2.4 in (6cm). 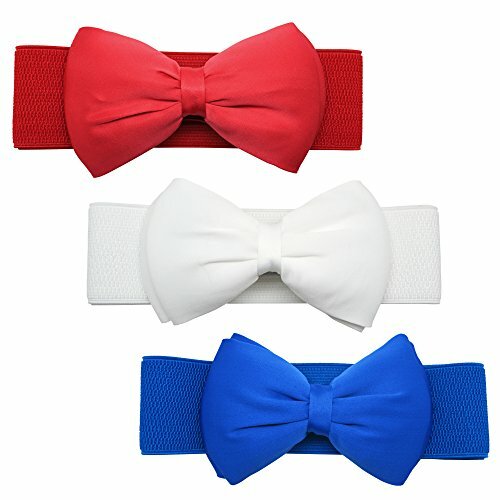 Size of Bow/Flower part: length: 5.5 in (14 cm), width: 3.5 in (9 cm). TIMELESS STYLE - This bow belt is a perfect adorable dresses addition which may not follow fashion trends closely, but it is absolutely timeless waist-accenting accessory with which you can dress up your look. A-line, wrap, sheath or halter etc., to be creative on what you will wear with it. SECURE CLOSURE - As a belt wearer, there was an awkward memory as some belt buckle/clasp kept popping off every two minutes, and you have to close it again and again. This belt snaps on with two strong metal popper buttons to keep the belt stay secure. CUSTOM FIT - It may be not as ritzy as a top-end leather belt, but the stretchy elastic will make the belt easily expand to fit larger waists and make the fit custom. If you have any questions about this product by Meta-U, contact us by completing and submitting the form below. If you are looking for a specif part number, please include it with your message.